Over 5,000 people joined us for fun on and off the water during our annual Bay Day event held on Sunday, June 3. Vendors lined up at Beekman Beach to share their organizational missions with the public and were treated to some good music from The Buzzards, who were on stage all day. The public was able to grab a bite to eat from Sweet Tomato and grab a seat at one of our picnic tables or on the beach as they enjoyed the beautiful weather and experienced the many activities provided by The WaterFront Center. 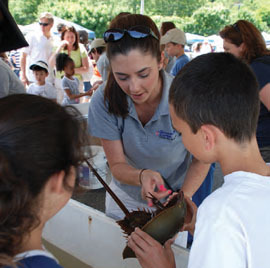 Jessica Cavanaugh, an educator at The WaterFront Center, shows a horseshoe crab to young Bay Day attendees. Crafts, which were free to all, drew some of the longest lines. Some of the more popular crafts were the ‘create your own t-shirt’ booth, where kids and adults were able to customize their Bay Day shirts using their favorite colors and designs, face painting, and sand art, another new addition this year was also a big hit, so popular in fact, that we ran out of supplies! For those who were looking for adventure, a swashbuckling troupe called Kings of the Coast (kingsofthecoast.net) organized a treasure hunt along Beekman Beach. Kayak and SUP demos, run by REI and EMS respectively, were extremely popular, giving people a chance to get out on the water at no cost for a brief paddle in West Harbor. Unless of course you were more interested in heading out on the high seas, and for those that were, we had two options: one aboard the historic oyster sloopChristeen, and one with our instructors aboard a Sonar. We had 13 Sonars out and about each taking up to four passengers at a time for 45-minute sails. The breeze was perfect and the sun was out, making it a great first time experience for many. More than 150 people got out on a Sonar in a three-hour time span – how awesome is that! In addition, our high school sailors competed in the third annual Bay Day Championship Regatta. West Harbor was filled with sails, and we hope all those who traveled on West Shore Road on Sunday afternoon were able to keep their eyes on the road. In high fashion, and in between storms, Bay Day concluded with the famous Anything That Floats Race. Numerous new and returning competitors came this year to put their craft-designing skills to the test. Craft this year were imaginative and fun. We are already looking forward to next year’s Bay Day. After additional tweaking, our annual event for the community is going to be better than ever! 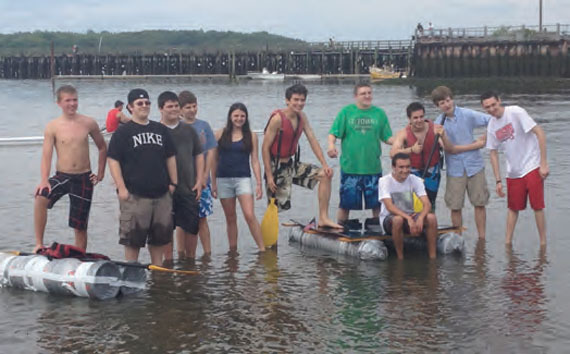 Participants in the popular Anything That Floats Race show off some of their watercraft. Make your coaching dollars go farther!